VjE Enterprises offers remanufactured ESI Model 44, Model 80 and Model 8000 laser trimming systems. 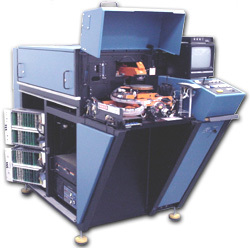 These systems are used for thick film resistor trimming, thin film resistor trimming, capacitor trimming, functional or "active" trimming, semiconductor processing and micro-machining applications. For more information about our refurbishing process click here or contact us a confidential evaluation of your application's requirements. The modular design of these systems allows them to be configured for a wide variety of applications in the Hybrid Microelectronics and Semiconductor industries. Laser kerf widths from 50 microns down to 5 microns can be achieved using the standard 1064 nm YAG wavelength. Upgrades to existing systems are also available. Please contact us about what upgrades are available. VjE fully supports the ESI Model 44, Model 80 and Model 8000 laser systems. We stock more replacement components for these systems than any other company in the world. Our Repair/Exchange (R/E) program consists of a large inventory of fully tested assemblies that are ready to ship the same day an order is placed. The R/E program is an inexpensive way to keep your systems in production. In addition to our Repair/Exchange program, our in-house repair department has the capability of repairing almost any circuit assembly used in the models of ESI laser systems described above. We are thoroughly familiar with all revision levels of the electronics used in those systems. If you have spares and can wait the lead-time to repair your damaged assembly, we can help you reduce your maintenance costs. Another maintenance option for ESI Trimming Lasers is our "Virtual Service Visit" where a VJE engineer works with your technical staff via a web camera to troubleshoot an issue or demonstrate an aligment technique. This is a quick and cost effective technical support method.